Piedfort Coins – Twice the weight, double the thickness ! Piedfort is a term used by numismatists to describe coins specially struck as either gifts or souvenirs by monarchs as far back as the twelfth century in France. In England, the monarchs being of French blood, continued the tradition – most notably by Edward I, who issued extra thick silver pennies. Since minting coins was not a centralised activity back then, it is thought that Piedforts were distributed to engravers at these different mints in order to show them what to copy. At this time, there were many different mints in England, Ireland, Scotland, Wales and the English-held lands in France – hence the die-makers in each mint would have something to copy from. Making the pieces deliberately thick and heavy ensured they were not mixed unintentionally with ordinary coins. The striking of Piedforts ceased in Britain in the sixteenth century but the tradition survived in France for at least another 150 years. Thicker than normal coins were also produced across Europe during the early modern period, particularly from the mid-16th C to mid-17th C, as part of a general trend to strike prestige pieces continued. It seems that the exchange of valuable gifts between rulers and members of their entourage became an established courtly exercise. Within this context coins struck on thick blanks, together with other types of prestige pieces, were prepared on behalf of kings and noblemen primarily for the purposes of presentation and display. It is also thought that producing this weight and thickness provided rulers with a conspicuous way of emphasising their wealth and power. After the decline of the European tradition of the prestige piece in the 18th C, the striking of modern Piedforts on a regular basis began at the Monnaie de Paris in the 1890s, partly in answer to demands from collectors at that time and since. The financial constraints of two world wars, leaving the gold standard and abandoning silver coinage meant that Britain did not produce Piedforts until 1982, when it sold a 20p Piedfort to the public. 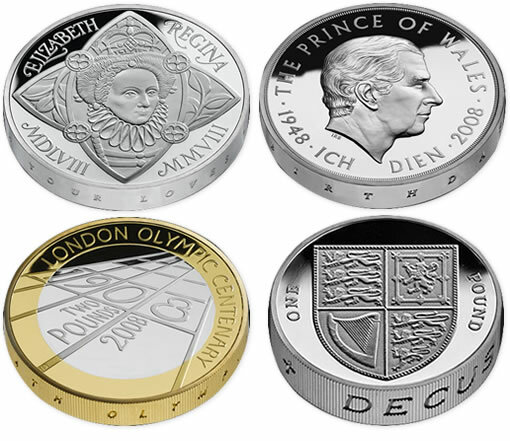 Since 1982 the Royal Mint has continued to strike limited editions of Piedfort coins in sterling silver to premier Proof standard to commemorate special anniversaries or to celebrate a brand new design. Marketed as prestige, limited editions and sold for multiple times their face value, they are mostly of interest to souvenir collectors, as opposed to normal coin collectors. Most of the modern Piedforts are made in silver, gold, or platinum. They are still usually double the normal thickness and weight, but some are only about 50% thicker and heavier than the normal circulated coins. Most are issued as proof coins, i.e. with highly polished fields (backgrounds) and matt finish on their raised design surfaces to emphasise their craftsmanship.